Photo from the Drum Corps World archives. Performing just one year in Drum Corps International competition in 1975, the Alberta Girls were an all-female corps from Edmonton. Entering Philadelphia's Franklin Field in their unmistakable white uniform dresses, calf-length boots and bushy bearskin hats, the Canadian corps would march its way to a seventh-place finish at the 1975 DCI World Championships in the All-Girl Class. 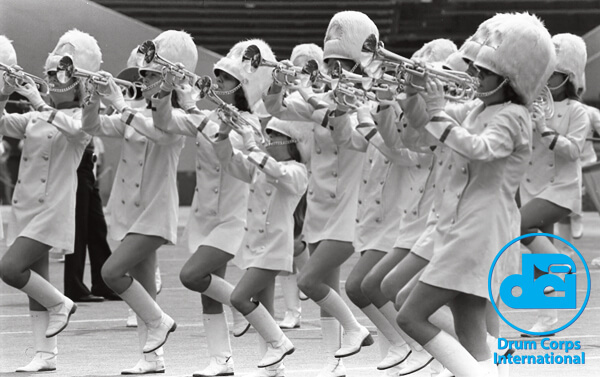 Originating in 1975, DCI's All-Girl Class would be in existence through 1982. In 1983, the female-only corps still competing were combined with DCI's A-Class. Though never returning to the DCI world Championships, the Alberta Girls remained active. In 1977 the group took a trip to Europe, performing in England, France, Germany and Italy. Read the DCI.org feature "Letters to my Mom: 1977 Alberta Girls trip to England."